The chapel of St. Catherine is one of the magnificently constructed old chapels in Taleigao, which is 5 kms away from Panaji. This chapel is dedicated to St. Catherine and is built of laterite stones with a tower on either side of the church façade of St. Francis of Assisi. This is a small chapel which is in the interior of this church, and has a plain altar. Day in 1510. 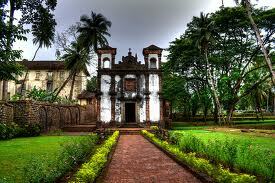 This was later rebuilt in 1552 over the existing remains of the earlier structure and was enlarged by the then Governor, George Cabral who inscribed a stone slab inscripting the entry of Alfonso De Albuquerque who captured Goa from the Muslim rulers on St. Catherine’s Day in 1510 and thus built this chapel. It is located west of the church of St. Francis of Assisi. The status of this chapel was later elevated to that of a Cathedral by Pope Paul III owing to a Papal Bill passed in 1534 A.D.